Some time ago I wrote about my disappointment with the e-readers that are on the market: for around 200 euros you get a machine that has no colour, can read no comics and no extra functions. So, when a few days ago Steve Jobs presented the iPad for Apple, I got several mails from people about this gadget. Some years ago (six?) I got one of these white 30gb iPods as a present, for a painting job that I did for somebody. He bought it for me in New York, when these things were not yet available in Holland. I hardly used it, apart from using it as a external hard disc for the old computer that I used back then. I prefer a simple life, with as little as machines as possible. Before I buy an iPad or another e-reader, I must be sure that it can do what I would like to do with it. And basically I want to listen to podcasts, read blogs, e-zines and e-books while I am on a train. But i can very well do without, so I am not in a hurry. There are also others, such as ones by Sony etc., incl. ‘pocket’ size ones with a 5” or similar-size screen. Not sure if those are any good. Is there a possibility you could repost the tunnelvision single? It seems that the link is broken. @ Alad: the link works again! 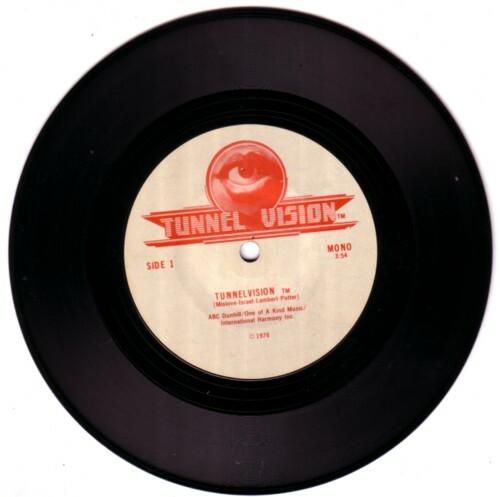 But judging from the quality of the rip of the a-side, it’s a way better (and WAY much cleaner and sharper) sounding vinyl rip than the 160kbps copy i found over <a href=“http://selmanaires.wordpress.com/2009/12/09/tunnelvision/”>here</a> a few hours after i posted the request – that copy sounded like it had been played a lot and got a bit dinged up. Not even click or denoising filters worked on the file to make it sound somewhat presentable. Oh well, i’ll just have to keep looking, i s’pose. TunnelVision kinda follows the same mold as The Groove Tube or Kentucky Fried Movie in being a parody of TV, movies or other pop culture of the day. It might seem prophetic giving where the entertainment world would become as we see today. No doubt nobody expected an Arnold Schwarzenegger film to be made out of the premise seen in “The Pregnant Man”. This was pretty edgy stuff for 1976 of course, but then, so was the writing of it’s day through such publications as National Lampoon or the underground comics that dominated a culture away from mainstream media. I would’ve wanted it too! I use to wear out my VHS copy of the film (itself a crappy EP-mode recording) over and over just to hear that song! The movie poster isn’t bad either if you don’t mind ‘toilet humor’. Oh, and in case someone still needs to convinced of the film’s prophetic abilities (dated references aside)! I managed to get Tunnelvision on DVD complete. They must have found a real good print because this one is flawless. But I also have this record. It too is pretty much mint. I actually liked the National Anthem they used!